My wheels are finished thanks to all of the suggestions here. I used parts of most of the suggestions and I am satisfied with the results and I hope the paint will provide corrosion protection on a working tractor for many years. The first couple of pictures show the initial condition of the wheels. They were not in too bad condition but the old paint was almost maroon color. On the inside (tube side) of the wheel some galvanizing was still visible. I first used a degreaser since I had used liberal amounts of Kroil on the rim bolts. Next came the paint stripper and it was very effective. After a couple of minutes the paint was no longer bonded to the metal. It was easily wiped off with a putty knife. It only took about 15 minutes per wheel to have all of the paint removed. The down side to this paint remover is that it is not friendly to the skin. I was using light weight rubber gloves-5 mil- from Harbor Freight and a spray can of the paint remover and about a minute after I finished spraying the wheel the back of my hand felt like it was on fire. I removed the gloves and washed my hand and within a few minutes the burning stopped. Use caution if you use this paint remover. Next came the wire wheels and it took most of a full day to remove the rust from both wheel centers and rims. I used up 3 wire wheels. The brackets/clamps where the wheel center bolts to the rim had rust inside that required a small wire brush to remove and I could not reach all of it. This was followed by POR Cleaner Degreaser and then POR Metal Prep everywhere except the tube side of one rim. I tried OSPHO there. The OSPHO worked well converting the small amount of remaining rust but the surface was rougher than areas treated with the POR Metal Prep. Looking back the rough areas may have been where some of the original galvanizing remained. After washing off the Metal Prep everything dried for a day. The brackets where I could not reach all of the rust received 2 coats of POR 15 and a light dusting of the POR self-etching Primer was applied to the second coat of POR 15 when it was tacky. It is sometimes hard to get a topcoat to stick to cured POR 15. About 2 days later I applied 2 coats of Rust-Oleum Rusty Metal Primer. I left it all in a heated room for a week and then used spray cans of IH Iron Guard 2150 for the centers and Rust-Oleum Hammered Silver on the rims. 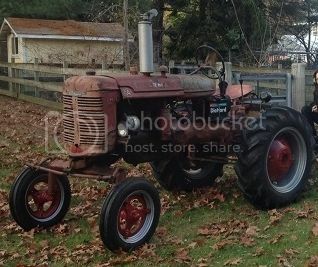 I know it will never be a show quality but I hope to have a good looking working tractor. I am not suggesting that anyone follow this procedure but just trying to explain what I did. Thanks again to everyone who provided suggestions since without these suggestions I would probably still be trying to figure out where to start. Nicely done clownfish! This information was exactly what I needed and most importantly in the form of presentation that I needed. Your description and photos were sure a help for me and I thank you very much. Now if I could figure out how to get pictures to show (like these) on the forum - I would be totally happy and not so obviously and totally technologically disadvantaged. By the way this forum is outstanding and all of you fellows with the bandages, bruising, scrapes, skinned knuckles and other healing wounds really keep these restoration processes real. I just got some PlastiKote steel wheel paint, from TP tools. Claims to be scratch and nick resistant. Probably won't get to try it, til spring. I think I ran out of painting weather. Now that you're a Pro, would you like to do some more??!! Mr E wrote: Glen, Now that you're a Pro, would you like to do some more??!! ScottyD'sdad wrote: I just got some PlastiKote steel wheel paint, from TP tools. Claims to be scratch and nick resistant. Probably won't get to try it, til spring. I think I ran out of painting weather. I just sprayed a set of rear rims, with the PlastiKote paint. Handles much better than most spray silver paints. Not as runny as the others,and seems to cover well. Time will tell, as to its durability. Claims to be durable, made for wheels. Clownfish, in your first picture above, it is easy to see the difference in the 2 colors of red on the Cub. It looks like you are using the newer IH red, and the wheels are the older IH red. But if you didn't paint the wheels before, there is no way to know if it is the IH red, or some other color. But it does look about like the older IH red, I think. Last edited by Glen on Sat Mar 26, 2016 8:20 pm, edited 1 time in total. The wheels that you see are from a parts tractor that I bought. It had better wheels than my tractor so I am using them. I don't know anything about its history except that it had been sitting outside in an equipment yard for at least 10 years and it is a 1948. It was obvious that it was repainted at some time but I have no idea about the color used. It was not very close to the New IH Red 2150. It is actually closer to a maroon but that could be from sitting outside for years. Maybe I can get a picture from an area that was more out of the weather and see how that compares. I know I'm a little late to ring in but I have used the Rustoleum hammered silver paint and am very satisfied with it. After needle scaling and wire brushing my rims I'll sand then wipe it down with lacquer thinner. Though they say you don't need primer I use an etching primer. With the hammered finish I find that the spray leaves less of a hammered finish than brushing it on. If you want more pronounced hammering brush it on. Either way it has a great look and holds up very well. Any imperfections in the rim are masked by the hammered finish. If it does get scuffed you can touch it up with a brush and it blends right in. I also have painted the centers and weights with the Rusoleum 2X Colonial red. It is very close to the Farmall Red finish being slightly darker. I've had the centers and weights on my "A" painted two years now and they are as good as the day I did them. Damn good for a rattle can finish. Wheels are the prettiest part of the tractor. One thing to note, above I mentioned using a needlescaler. It works better than anything else I've ever used, paint remover, sand blasting, anything. It is loud and you'll need hearing protection. The debris drops straight down instead of throwing it everywhere and there is no grit to ruin seals or fumes to inhale. You can put the pins against your hand and it will do no harm but will knock away rust scale and old paint very well. I bought both the large and small units from Harbor Freight and there is a difference. Don't bother with the smaller one, the larger unit is much better and is the only one I use now. I actually just loaned it to friend to clean up a 30 year old rear assembly for a car that looked like junk. He stripped it to bare metal in an hour and is now amazed with the tool. I also asked him how much mess did it make? He said next to nothing, its amazing!